I am a Managing Director of the Upledger Institute Ireland and I share this responsibility with my friend and colleague Mary Brady another CranioSacral Therapist. Upledger Institute Ireland is a satellite of the Upledger Institute Inc, Florida. We are responsible for all Upledger CranioSacral Therapy Training in Ireland. 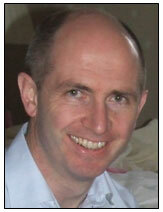 I have been Practicing CranioSacral Therapy at the Fairgreen Holistic Clinic, Naas, Co Kildare for some years now. My clients are babies, children and adults with a wide range of health and emotional issues. A high percentage of the children that come to the clinic have autism and the babies may have had a difficult time being born or are not settling into life for some reason. When I finished school, I worked in the Ornamental Horticulture Industry. For the first few years I worked as an apprentice on some of the largest nurseries in Ireland. And I then set up and managed my own nursery for 7 years. During this time I ran into some health problems and I was having some difficulty with them. I found Craniosacral Therapy and the book Your Inner Physician and you by Dr John E Upledger. I was hooked, and in CST, I found the answer to my health issues and my new career. I closed my business and went on to train in CranioSacral and Massage. My craniosacral training was with the Upledger Institute Ireland and U.K. and I have trained in general Craniosacral therapy, SomatoEmotional release, Craniosacral therapy for Paediatrics and the Brain Speaks. I am happily married to Ann, and we have one beautiful daughter called Kate. I was born into a large family in rural County Kildare. Now I am in the wonderful position of having this work in my life every day.